The U.S. Justice Department’s indictment of 12 Russian intelligence officers for attempting to interfere in the 2016 U.S. presidential election reveals new details about attackers’ tactics – and failures. The indictment, which came via Special Counsel Robert Mueller’s ongoing investigation into that interference, describes new details about who was hacked and how, including operational security – OPSEC – successes and failures, including the use of cryptocurrencies to help mask intelligence agencies’ activities. Thomas Rid, professor of strategic studies at Johns Hopkins University, calls the move by the FBI and Justice Department to indict the Russian intelligence agents as being “truly extraordinary,” in that it calls out not only two GRU units by name – 26165 and 74455 – but also lists their commanding officers and team members and reveals operational details, even including defendants’ online searches for the PowerShell commands they needed to hack into the DNC’s Microsoft Exchange Server. “I can’t think of a historical precedent that goes into similar detail in response to active measures,” Rid says via Twitter. But this isn’t the first time that the Justice Department has singled out intelligence agency operatives or individuals acting as state-sponsored hackers on criminal hacking charges. At least four other such cases have already been seen, beginning with the Justice Department in 2014 indicting five Chinese army officers for hacking American corporate computers to steal intellectual property. What is unusual about this new indictment, however, is that President Donald Trump doesn’t appear to be backing the FBI, Justice Department or intelligence community’s findings. After a meeting with Russian President Vladimir Putin on Monday in Helsinki, Trump called the Mueller probe “ridiculous” and “a disaster for our country” and appeared to prioritize Putin’s denials over U.S. law enforcement and intelligence agencies’ conclusions. “President Putin was extremely strong and powerful in his denial today,” Trump said. Trump also repeatedly asked about the Democratic National Committee’s email server and Hillary Clinton’s missing emails. Twelve individuals have been named in the new indictment. “These GRU officers, in their official capacities, engaged in a sustained effort to hack into the computer networks of the Democratic Congressional Campaign Committee, the Democratic National Committee and the presidential campaign of Hillary Clinton, and released that information on the internet under the names ‘DCLeaks’ and ‘Guccifer 2.0’ and through another entity,” according to the Justice Department. 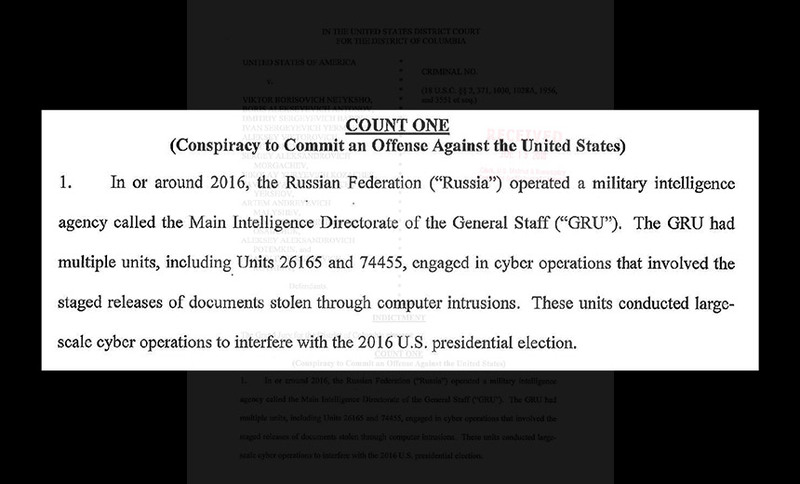 The indictment also reveals that despite the DNC and DCCC in May 2016 hiring Crowdstrike to help remediate the intrusions – which the FBI also began investigating – at least one piece of X-Agent Linux malware planted by attackers persisted until October 2016. And in September 2016, attackers allegedly also “successfully gained access to DNC computers hosted on a third-party cloud computing service” that “contained test applications related to the DNC’s analytics,” it says. The attackers allegedly created backups of this data, then transferred them to their own account, allowing them to obtain the actual data. The indictment says the Russian agents successfully infected a DCCC employee’s PC with X-Agent malware, which allowed them to log her keystrokes and capture screenshots. This victim appeared to be “patient zero” in the hacking campaign. The agents then “hacked into the DNC network from the DCCC network using stolen credentials” and by June 2016 had accessed about 33 different DNC computers, onto which they deployed the same X-Agent malware (see DNC Breach More Severe Than First Believed). “Although the conspirators caused transactions to be conducted in a variety of currencies, including U.S. dollars, they principally used bitcoin when purchasing servers, registering domains and otherwise making payments in furtherance of hacking activity,” according to the indictment. The indictment alleges that the defendants, in part, generated their own bitcoins via mining – solving computational challenges that build out the public ledger of transactions, called the blockchain, for which miners can receive bitcoins as a reward. The indictment says other bitcoins were acquired in ways designed to obscure their origin, which included “purchasing bitcoin through peer-to-peer exchanges, moving funds through other digital currencies and using pre-paid cards.” The defendants also allegedly used bitcoin tumbling services to disguise their activities (see Criminals Hide ‘Billions’ in Cryptocurrency, Europol Warns). The defendants, the indictment alleges, used bitcoins “to pay a Romanian company to register the domain dcleaks.com through a payment processing company located in the United States,” as well as to lease a server in Malaysia that hosted the DCLeaks.com website and which was used to target the DCCC and DNC networks via spear phishing attacks. The same bitcoin pool was also used to pay for a virtual private network account that was used to log into the Guccifer 2.0 Twitter account, authorities say (see Analysis: VPN Fail Reveals ‘Guccifer 2.0’ is ‘Fancy Bear’). “This is the first clear example in court documents of cryptocurrency being used to purchase capabilities that could be leveraged in attacks on national security,” Jonathan Levin, a co-founder of Chainalysis, a firm that helps governments track cryptocurrency payments, tells the New York Times. The indictment reveals that Russia’s use of “active measures” – aka dezinformatsiya or disinformation, pioneered in the Soviet era – remains alive and well, Rid says. In the case of the DNC and DCCC hacks, stolen information was disseminated via the Guccifer 2.0 persona – which claimed to be a sole Romanian hacker – as well as the DCLeaks.com website, which claimed to have been founded by an American hacktivist. Both were Russian intelligence fronts, prosecutors say. In addition, the indictment says WikiLeaks – again, referenced only as “Organization 1” – actively solicited stolen DNC data from Guccifer 2.0 and later published a selection of the stolen information. Referencing research collected by Secureworks into the Russian attack group that targeted Hillary Clinton’s campaign, among others, Rid at Johns Hopkins reports that attackers’ success rate appeared to be at least 2 percent. The Russian intelligence agents didn’t just allegedly hack the DNC and DCCC, prosecutors say. “Russian GRU officers hacked the website of a state election board and stole information about 500,000 voters,” Rosenstein said on Friday. While he didn’t name the state, based on previous reports it appears to have been Illinois (see Will Congress Lose Midterm Elections to Hackers?). “They also hacked into computers of a company that supplied software used to verify voter registration information; they targeted state and local offices responsible for administering the elections; and they sent spear phishing emails to people involved in administering elections, including attaching malicious software,” Rosenstein said. But Russia’s hacking activities, according to the U.S. intelligence community, were designed to influence the elections, backed by probes of at least 21 states’ election systems and the successful hacking of at least one state election board. Attackers also targeted voting machine manufacturers, prosecutors say. Director of National Intelligence Dan Coats, speaking Friday at the Hudson Institute in Washington, said such hacking – by not just Russia, but also China, Iran and North Korea – poses a clear and present danger to other nations, including the United States. “It was in the months prior to September 2001 when, according to then-CIA Director George Tenet, the system was blinking red. And here we are nearly two decades later, and I’m here to say, the warning lights are blinking red again,” Coats said.